Set lunch menu available every day. 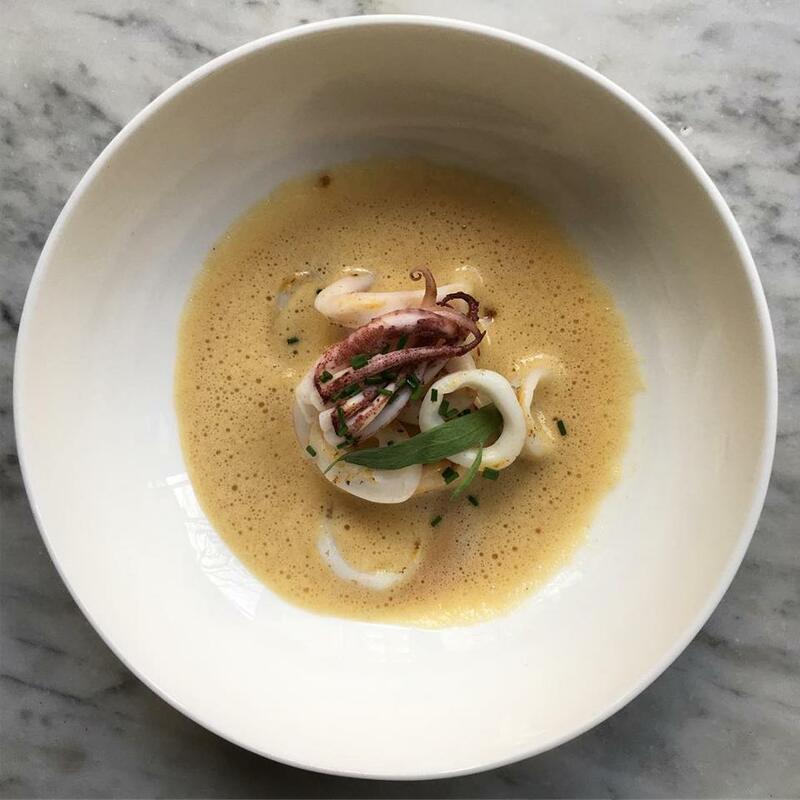 Noble Rot Restaurant & Wine Bar is located in an atmospheric townhouse on Bloomsbury’s Lamb’s Conduit Street. 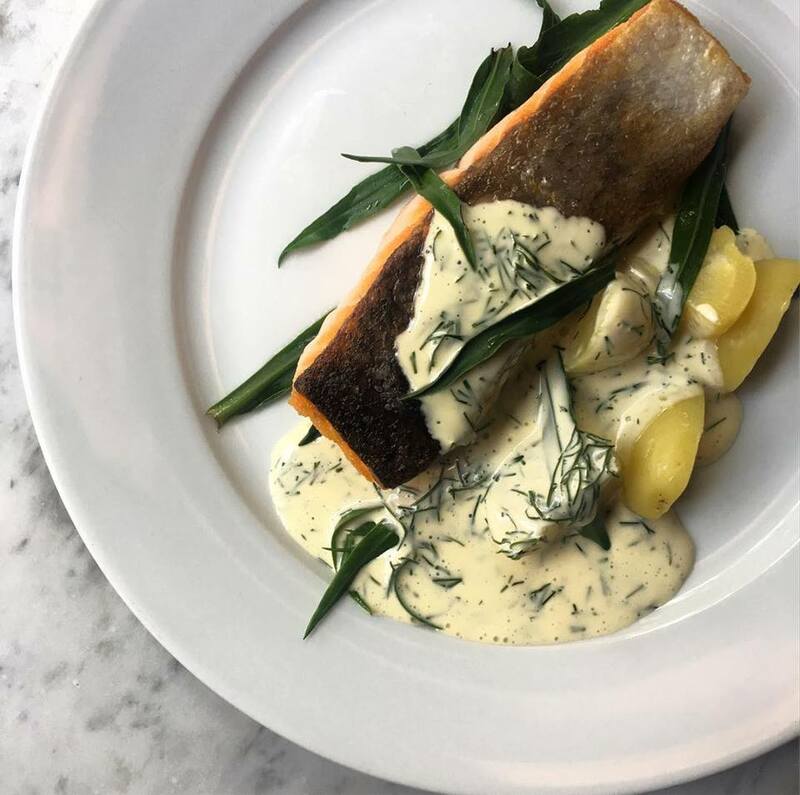 Head chef Paul Weaver and Consultant chef Stephen Harris from the Michelin-starred The Sportsman in Whitstable oversee a full à la carte menu of fine Franglaise style cooking in the restaurant, and a selection of small dishes in the bar. The wine list ranges from deliciously undervalued wines by the glass to hard-to-find gems from the worlds leading winemakers. 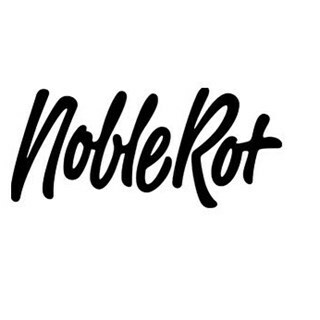 Noble Rot Restaurant & Wine Bar won Wine List Of The Year at 2018, 2017 & 2016 National Restaurant Awards and 2016 Harden’s London Restaurant Awards. 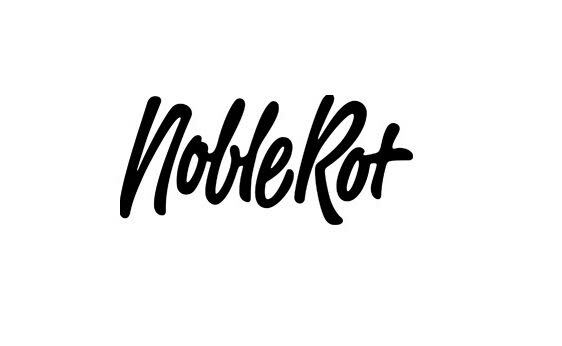 We’re thrilled to be able showcase the spirit of Noble Rot Magazine in our atmospheric townhouse on one of central London’s most attractive streets, and hope to welcome you soon. 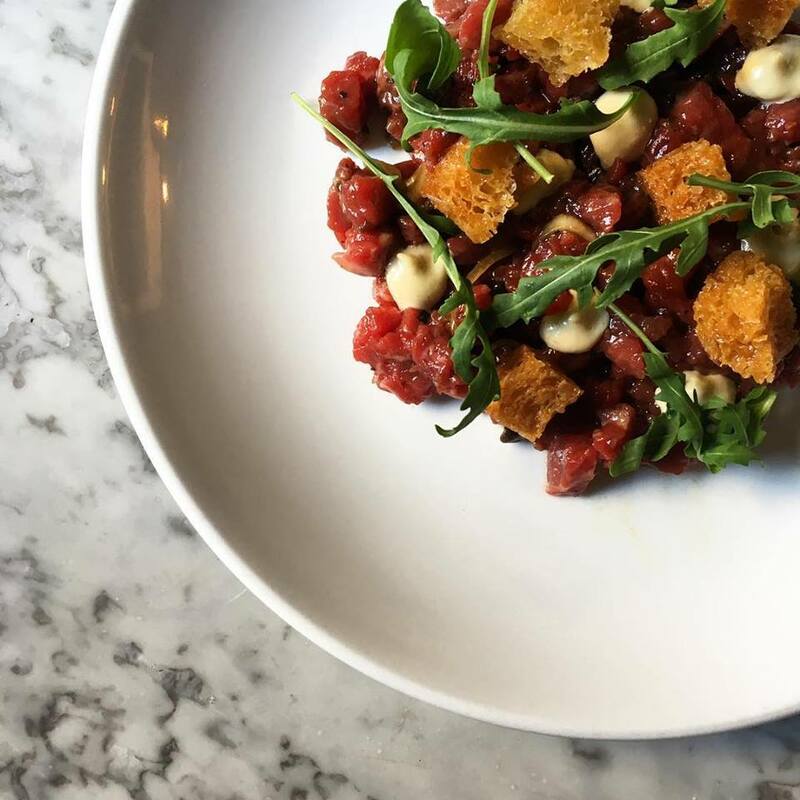 We take reservations for the restaurant online and by phone, whilst tables in the front bar section are allocated on a first come first served basis. I think that the effort that a restaurant puts into its bread is often a pointer to the care taken with the rest of the meal. Some restaurants source lazily, others buy with care and the best usually make at least some of their own. The focaccia here is made in-house and is spectacularly good. Too often this bread can end up dry and disappointing, but here it is gorgeous and supple (17/20). There is also good soda bread that they make here and the top class sourdough from Hedone. I could not resist repeating the signature starter of slip sole (baby Dover sole) with smoked butter, simple yet beautifully cooked (16/20). This was better than a grilled whole mackerel starter with pink grapefruit vinaigrette and some leaves. The grapefruit is a logical pairing with the oily mackerel, but the leaves could have been better and this particular specimen of mackerel had merely ordinary flavour, though it was well cooked (13/20). Halibut braised in oxidised Burgundy with leeks and potatoes was better, the fish accurately cooked and the old wine (a 1998 Batard Montrachet) in which it was cooked added some character (14/20). Even better was squab pigeon from Anjou with puy lentils and peas. The bird was lovely and cooked pink, with its liver adding an interesting extra flavour; the young peas were tender and the puy lentils brought a pleasing earthiness to the dish (easily 15/20). Desserts were a mixed bag. Pistachio cake with blood orange and mascarpone was very enjoyable, the cake having good texture and plenty of nutty flavour, the orange a pleasant contrast to the creamy cheese (14/20). Warm chocolate mousse turned out to be just that, a bowl of melted chocolate mousse. The quality of the chocolate was fine, and I am as big a fan of chocolate as the next person, but there was nothing whatever to go with it, so it was ultra-rich. There was no biscuit to bring another texture, no extra element to cut through the richness, just a bowl of warm chocolate. This is the kind of thing that someone might serve up at a dinner party but I would have hoped for something a bit more here. It was far too rich for me to finish (hard to score, but maybe 12/20 as the chocolate itself was of good quality). Service was capable, and the sommelier in particular knew his stuff. As a little treat they had a rarity on the wine list by the glass – Yquem “Sauternes 2” (£12), a non-vintage wine from the legendary Chateau but not usually sold commercially. It is a much simpler wine than the flagship Yquem but still had lovely fruit showing through. This is the kind of gem that pops up on the list here, a by-product of having owners that run a wine magazine. The bill came to £90 a head with a bottle of the excellent JJ Prum Riesling Kabinett and a glass apiece of the “Sauternes 2”. If you shared a modest bottle of wine from the terrific list then a cost per head for around £65 would be more typical. The meal tonight was more erratic than my first lunch here, but Noble Rot is a most enjoyable place to eat at, with a stunning wine list and some genuinely top notch dishes. Super lunch, very nice attentive knowledgeable staff. A real gem of a place - characterful, without being ostentatious, and fantastic food. A very busy Saturday and the service was still excellent. Room a wine recommendation and it was worth every penny. Food was exceptional. Great flavours. Only negative. The tables are a bit small! Delicious as usual, with very attentive and knowledgeable waiters and waitresses and cosy atmosphere. I always have a good time here and the wine list is impressive - there's something for everyone in there! Third visit and as good as before. Quite a special place amid a sea of mediocre restaurants. Fantastic evening. Great food and setting, made all the better by really friendly front of house team. Will definitely be back. Enjoyed everything about dinner. Quality, unfussy cooking of top ingredients. Clear flavours coming through in every dish. Relaxed but professional service. Top wine list. I’ll be back. We had an excellent meal! Already told friends and family they need to try the set lunch menu. The staff that served us were polite, friendly and made us feel really welcome. The food was excellent and great value. We will be back next time we are in London. 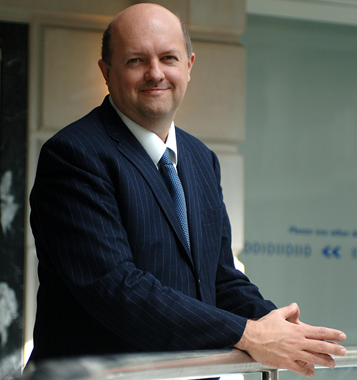 Wonderful service , it felt relaxed but professional and unpushy. Food was fantastic , we really enjoyed our visit and hope to visit again one day. Brilliant service, and the set lunch menu is an absolute treat! Great food, very reasonable prices, and a great wine pairing option. I had a wonderful evening, top to bottom. Our server made us feel right at home in what could have easily been an intimidating setting. Food, wine and ambience all spectacular. Will certainly be returning. We very much enjoyed the food, wine and environment. Though it has to be noted that the service was not present or engaged. A delicious set lunch  - and it’s a bargain. Great wine, of course. Lovely, knowledgable team. Beautiful meal in an excellent ambiance. Will definitely be back.